For the first time, workers' compensation medical payments were more than cash payments, according to a report from the National Academy of Social Insurance. Medical payments in 2008--the latest year for which complete data is available--rose 8.8 percent over the previous year to $29.1 billion, slightly more than the $28.6 billion in cash payments. Cash payments also increased, but only slightly. 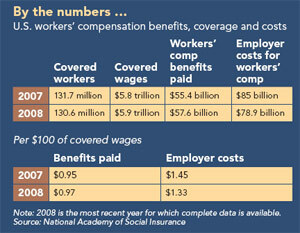 Per $100 of covered wages, medical payments were $0.50 and cash payments to workers were $0.48. John F. Burton Jr., who chaired the panel that oversaw the report, speculated that the switch may be linked to rising medical costs and greater use of services. "The increase is the continuation of a long-term trend since 1980, but this is the first year that payments for medical care were more than half of all workers' compensation benefits," he said in a press release.